You have spent weeks creating a couture, Chanel-inspired suit: selecting fabric, measuring, cutting, basting, sewing, finessing each element so that it would make the master herself proud. To finish it off, you need a masterfully matched, expertly attached designer trim. Once again, couture sewing expert Claire Shaeffer is here to teach you how. Couture Sewing: Making Designer Trims presents sewing methods Claire Shaeffer has developed based on her own meticulous research into couture sewing methods and techniques. This unique, multimedia approach, which includes detailed step-by-step instructions, photos, and how-to video, form an essential resource for sewists looking to elevate their garments to the next level by adding appropriate trims. 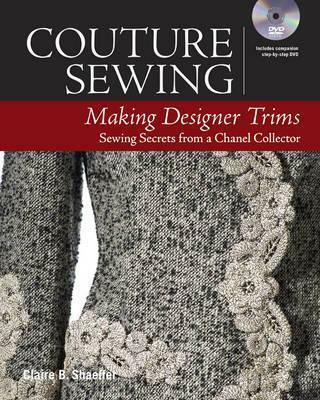 This must-have resource gives an overview of the different types of trims that are used in a couture workroom and explains different methods for attaching the trims to a garment. As a bonus, you'll learn how to create trims from scratch. As with the other volumes in the Couture Sewing series, the printed book presents intriguing garment examples from Shaeffer's impressive personal collection, alongside information on the construction methods used to create them.